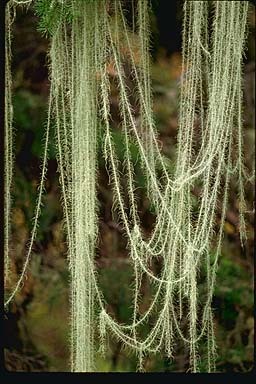 Usnea longissima, or "Methuselah's beard lichen", hanging from a Douglas-fir (Pseudotsuga menziesii) in the Oregon Cascades. This is easily the longest lichen in the world. It is extremely sensitive to air pollution and has vanished from most of Europe. Even in the Pacific Northwest, where one occasionally sees good stands of it, it has strict habitat requirements, is slow to grow or to spread, and it should never be collected. Usnea longissima was used for bedding and pillow stuffing in places as far apart as the Simla Hills of India and British Columbia, Canada, and it may have been the original Christmas tree tinsel (does anyone out there have information about this?). With names translating as "pine gauze" and "Lao-tzu's beard," it was described in the earliest Chinese herbal, from about 500 A.D.